Shirts With Random Triangles: USC players had team meeting that Lane Kiffin denied had happened. USC players had team meeting that Lane Kiffin denied had happened. Lane Kiffin. photo via SB*Nation. 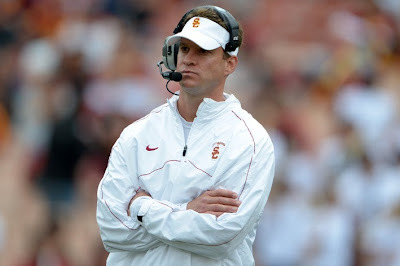 It's "Lane Kiffin has lost control of USC" time. The USC head football coach, whose Hot Seat seems to be getting hotter by the day, apparently doesn't know what his players are up to. (Then again predecessor Pete Carroll claimed the same thing about Reggie Bush. But that's neither here nor there). What they were up to, according to USC wide receiver Marquise Lee, was having a team meeting without him. That despite Kiffin claiming the meeting didn't happen. Lee said the meeting did not focus on the Washington State loss but the future. There are probably a lot of things happening on the USC football team that "Kiffin don't know" about or would claim to not know about. Which is what got USC on probation under Carroll. USC athletic director Pat Haden may have to decide that it better to fire Kiffin sooner rather than later if stories about the coach's seeming lack of control over his team get any worse.